Posting as much as I do here in my blog and on Facebook, it’s sometimes easy to be sucked into sharing images that I know will generate the most enthusiastic response. But that’s not a complete reflection of my relationship with nature, or the reason I take pictures for a living. So every once in a while I find myself needing a reset, a re-focus on images for me. Here’s an example of the kind of stuff that makes me happy. Fall color is always beautiful, but merely putting your eye to your camera and photographing a beautiful scene is no guarantee of a successful image. The closer you can come to identifying a scene’s essence, what about the scene that moves you (and not what you think will move others), the more your photography will resonate. The obvious draw of fall color is (duh) the color. But beyond that, I particularly love the way leaves light up when they’re backlit. So when I wander forests in the fall I look for backlit leaves that stand out, leaves I can isolate from the distraction of their surroundings. When I find something that works, my job has just begun. Next I look for a complementary background that (if I’m lucky) also adds context (location, conditions, and so on). And finally I need to make my depth of field decision—do I want lots of DOF, or will too much background detail distract from my subject? 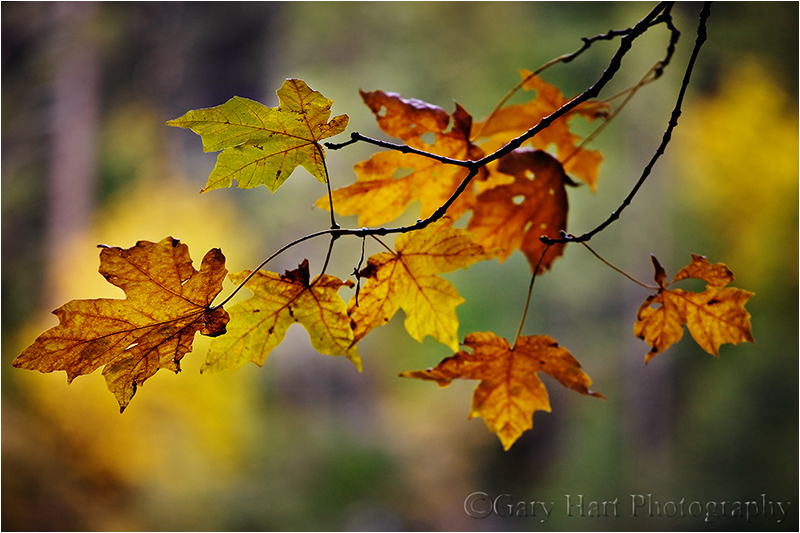 I found this group of leaves as I wandered the Merced River near Fern Spring in Yosemite Valley a few years ago. I move around until the leaves aligned with vertical evergreen trunks and a splash of deciduous color. The forest had lots going on, so I opted for a wide open aperture to reduce it to a barely recognizable blur of color, shape, and line. Scenes like this underscore my desire to be in charge of as much of my camera’s decision making process as possible: spot metering in manual mode, manual focus, raw capture—all these things remove the decision process from my camera and give it to me. In this case, before composing I metered on a bright leaf and set the exposure to what I thought would give me the best color (in manual mode I can point my camera’s meter anywhere and not have to worry about my settings changing when I recompose). The wind was nearly calm, but to be safe I bumped my ISO to 200 (the quality difference between ISO 100 and 200 is nearly imperceptible) to further ensure against microscopic motion blur. And since I shoot in raw mode, I never have to make my white balance decisions until I’m in the comfort of my home office. When all my settings were complete, I returned my camera to the tripod, focused carefully on the center vein of the most prominent (left-most) leaf (at f4 there’s no margin for focus error), and clicked. It’s unfortunate that nature’s subtle beauty doesn’t attract the attention that the dramatic sunrises, sunsets, and spectacular weather do. I enjoy photographing those scenes as well, but I never want to forget to appreciate the small stuff. Wow – Fall is my favorite time of year and now I know why. The colors in your photographs are amazing. I especially loved Poppy Lanterns, Meadow Dewdrop and White-Out. Brilliant. These images are what inspired me to take one of your workshops – the Spring Moonbow – and that is one of the best decisions I ever made. If we don’t make ourselves happy doing this, then it does become work and stops being a passion. Thanks for helping keep my photography passion alive.